Can’t wait to find out if you’ll be welcoming a baby boy or girl? A gender reveal party could be the perfect way for you to find out, and announce, your little one’s gender. What Do You Do At A Gender Reveal Party? At a gender reveal party, you and your guests – your friends and family – discover the gender of your baby. 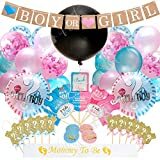 A gender reveal party is very similar to a traditional baby shower but is held much earlier in pregnancy, usually around halfway through, with both men and women invited. Gender reveal parties are increasingly popular, with increasing views on Youtube and other social media platforms including Instagram and Pinterest. To help you plan the perfect gender reveal party, read our steps below or visit Gender Reveal Guide. First things first, you need to find out the gender of your baby. You do this by getting a gender-determining ultrasound at around week 20 of your pregnancy. Ask the sonographer not to tell you the gender but to write it down on a piece of paper, and then place it in a sealed envelope. Don’t lose this envelope, and try to resist the temptation to look at the paper inside! A word of warning; it’s not guaranteed that you’ll find out the gender at your 20-week scan. The sonographer might not be able to confirm the gender if the baby is in a difficult position, or has their legs in the way. You might have to schedule another ultrasound in a couple of weeks. It can be a great idea to plan your gender reveal party around a theme. You can use this to design your invitations, decorations and day. Bumblebees: what will it bee? Bow ties or hair bows? Choose a theme that means something to you, you’re happy with and you’ll be happy to center your day around. Now you’ve had your ultrasound and decided on your theme, it’s time to invite people to your gender reveal party. Design your invitations around your theme. It will look great and will let people know what theme you’ve chosen for the day. You can order invitations and deliver them to guests, or send them electronically. It’s a good idea to organize some food, drink, fun and games to keep everyone entertained. There’s no need to serve a three-course meal. Snacks and nibbles will do. If you can, try to decorate your food and drink using your theme. Blue or pink? Try using blue and pink cups. What will it bee? Bumblebee decorations would look great. Bow ties or hair bows? You could decorate cookies or cupcakes to match. It’s time for the big reveal, the moment everyone’s been waiting for! How will you announce if you’re having a boy or girl? If you want to use a sweet treat, take your sealed envelope with your baby’s gender to a bakery. You can ask them to create a cake or cupcakes filled with either blue or pink frosting. That way, when you cut into the cake or take a bite, you’ll find out the gender of your little one. Or you could give the envelope to a trusted friend who can use piñata filling, helium balloons or socks in a box to reveal the gender of your baby. You can find more gender reveal ideas here. Whatever you choose, you’ll have an amazing moment that you can share with your family and friends. Your gender reveal party is such a special day and one that you want to remember. So, make sure you capture the day! Depending on your budget and day, ask a friend or professional to take photos or a video of the day. It’s always great to have something to look back on. You can also invite guests to write messages for the baby. You can read them on the day, or wait until the baby arrives, to remind you of your gender reveal party. Once the party is over and your baby’s gender has been revealed, don’t forget to thank your guests for sharing this day with you. You may want to give your guests some favors to leave with. If you can, try to keep these in line with your theme. They can be as big or as little as you’d like; whatever you’d like your guests to have to remember the day. Of course, favors aren’t mandatory. You’ve all shared an amazing day together. Follow these steps, and you’ll have a gender reveal party that is fun for everyone. Remember that this day is for you and your baby. Make sure you spend the day doing things that you’ll enjoy and will be happy to look back on and remember. And whatever happens, you’ll know if you’ll be welcoming a little boy or girl in a few short months. Soon it’ll be time to plan your baby shower and get ready for your new arrival!